RZR Cooter Brown Polyethylene Top Fits: 2008-14 RZR 800, 2009-14 RZR-S 800, 2011-14 RZR XP900, and 2012-16 RZR 570 Made from 1/4" thick black Polyethylene (preformed thickness). LED dome light with aluminum housing. Light will run up to 100 hours on the batteries (included). Includes: Rubber coated mounting straps and hardware. Ships via standard ground delivery. Polyethylene is very rugged and functional. 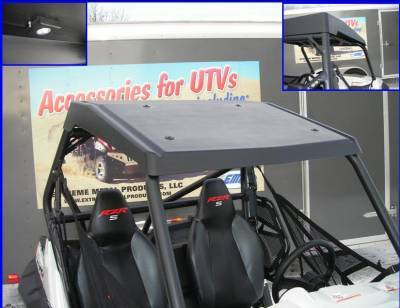 Used to make ATV fenders, Polyethylene has proven to be very durable and is still the material of choice by most major ATV manufacturers today, since it is much more flexible than ABS Plastic. Unlike most aftermarket and factory tops, the Cooter Brown Top extends all the way to the sides of your cage, even protecting your shoulders.